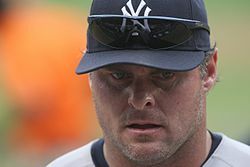 Jason Gilbert Giambi (/dʒiˈɑːmbi/; born January 8, 1971) is an American former professional baseball first baseman and designated hitter. In his Major League Baseball (MLB) career, which began in 1995, Giambi played for the Oakland Athletics, New York Yankees, Colorado Rockies, and Cleveland Indians. He is the older brother of former MLB player, Jeremy Giambi. 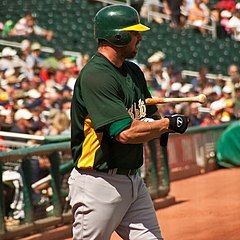 Giambi was the American League (AL) MVP in 2000 while with the Athletics, and is a five-time All-Star, who led the AL: in walks four times; in on-base percentage three times; and in doubles and slugging percentage once each; he also won the Silver Slugger Award twice. Giambi has publicly apologized for using performance-enhancing drugs during his career. Giambi attended Sacred Heart Private Catholic School in Covina, California. He then attended South Hills High School in his native West Covina, where he was a three-sport standout. Giambi was on the baseball team, whose roster also included his brother Jeremy and three other future Major Leaguers and teammates: infielder Shawn Wooten, pitchers Aaron Small and Cory Lidle. He batted .386 during his three years of varsity baseball, leading his team to the state finals as a senior. He was voted MVP in both baseball and basketball. In American football, he was an All-League quarterback. Giambi was selected in the 43rd round (1,118th overall) by the Milwaukee Brewers during the 1989 MLB draft. He did not sign and went on to attend college. In the 2000 season, he led the league in on-base percentage (.476; leading the majors) and walks (137; a personal high and still the most walks in the AL since 1991). He hit .333 (7th in the league) with 43 homers (2nd; a career high), 137 RBIs (4th; a career high), 108 runs (10th), and a .647 slugging percentage (3rd). 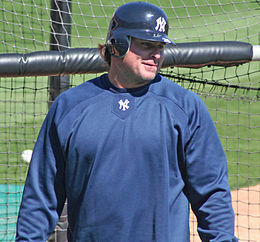 Giambi narrowly won the American League Most Valuable Player Award over Frank Thomas. 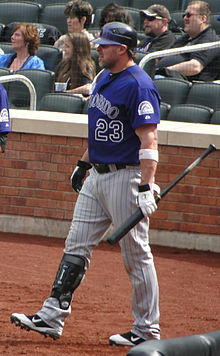 Looking for a veteran bat to help their playoff push, the Rockies agreed to a deal with Giambi on August 23, 2009. He was assigned to their AAA affiliate, the Colorado Springs Sky Sox. Giambi chose to wear the number 23 for his jersey number. His first RBI with the Rockies came in the form of a bases loaded walk in his first plate appearance on September 1, 2009, after being promoted to the club upon roster expansion earlier that day. That year, he had many clutch hits which kept the Rockies in contention for the National League Wild Card. He quickly became a fan favorite in Colorado. ^ Thompson, Teri (May 18, 2007). "Giambi admits he took steroids". Daily News. New York. ^ "February baseball triggers memories of Jason Giambi's first spring training, which he spent in silence". cleveland.com. Retrieved February 16, 2015. ^ Curry, Jack (December 14, 2001). "Tearful Giambi Is Proud To Put On the Pinstripes". New York Times. p. S1. ^ King, John (May 16, 2005). "Fan who threw beer at Giambi was jailed". San Francisco Chronicle. ^ "Major League Leaderboards » 2003 » Batters » Advanced Statistics | FanGraphs Baseball". Fangraphs.com. Retrieved September 14, 2011. ^ "Major League Leaderboards » 2003 » Batters » Batted Ball Statistics | FanGraphs Baseball". Fangraphs.com. Retrieved September 14, 2011. ^ "Giambi hits two homers, reaches 300 for career". Associated Press. July 31, 2005. Retrieved October 9, 2006. ^ "Major League Leaderboards » 2005 » Batters » Advanced Statistics | FanGraphs Baseball". Fangraphs.com. Retrieved September 14, 2011. ^ "Major League Leaderboards » 2005 » Batters » Batted Ball Statistics | FanGraphs Baseball". Fangraphs.com. Retrieved September 14, 2011. ^ "Major League Leaderboards » 2006 » Batters » Advanced Statistics | FanGraphs Baseball". Fangraphs.com. Retrieved September 14, 2011. ^ King, George A. (September 4, 2008). "Jason Giambi Loses Bout With Bathroom Door". New York Post. Retrieved September 14, 2011. ^ "Giambi rejoins Oakland, gets $5.25 million deal". Sports.yahoo.com. April 20, 2011. Retrieved September 14, 2011. ^ Sporting, The (August 7, 2009). "The drumbeat:Giambi Released". SFGate. Retrieved September 14, 2011. ^ "Jason Giambi reportedly agrees to deal with Colorado Rockies". ESPN. August 23, 2009. Retrieved September 14, 2011. ^ Harding, Thomas (January 17, 2011). "Rockies bring back Giambi with Minors deal". MLB.com. Retrieved January 17, 2011. ^ "Giambi, 40 and Scuffling, Hits 3 Homers Against the Phillies". New York Times. May 19, 2011. Retrieved May 19, 2011. ^ "Giambi, Rockies Manager". New York Daily News. ^ Bastian, Jordan (February 9, 2013). "Tribe signs veteran slugger Giambi to Minors deal". MLB.com. Archived from the original on February 13, 2013. Retrieved February 10, 2013. ^ "Scott Kazmir named Indians' fifth starter, Jason Giambi makes the team". Retrieved May 13, 2013. ^ "Chicago White Sox vs. Cleveland Indians – Recap – July 29, 2013 – ESPN Chicago". ESPN.com. Retrieved February 16, 2015. ^ "Roll Tribe! Jason Giambi's walk-off homer sends Cleveland Indians fans into joyful frenzy on social media". cleveland.com. Retrieved February 16, 2015. ^ Nowak, Joey (March 13, 2014). "Giambi has broken rib, likely to miss opener". MLB.con. Retrieved March 13, 2014. ^ "Indians activate DH Jason Giambi". USAToday.com. April 21, 2014. Retrieved April 21, 2014. ^ Adams, Steve (February 16, 2015). "Jason Giambi Retires". mlbtraderumors.com. Retrieved February 16, 2015. ^ "Admissions before BALCO grand jury detailed". ESPN. December 2, 2004. Retrieved October 9, 2006. ^ "ESPN – BALCO leaker Ellerman gets 2½ years in prison – MLB". ESPN. July 12, 2007. Retrieved September 14, 2011. ^ "Giambi says MLB should own up to presence of drugs". ESPN. Retrieved May 18, 2007. ^ "Report: Jeremy Giambi admits he used steroids". USA Today. March 13, 2005. Retrieved May 25, 2007. This page was last edited on 21 April 2019, at 19:50 (UTC).